Gaston Camille Charles Maspero (June 23, 1846 - June 30, 1916) was a French Egyptologist who served as director of the Egyptian Museum in Cairo, where he established the French School of Oriental Archaeology. Originally trained in linguistics, Maspero began his career translating hieroglyphs. 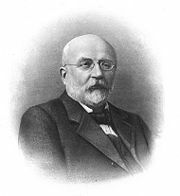 On the death of his colleague, Auguste Mariette, Maspero took over the directorship of excavations in Egypt. 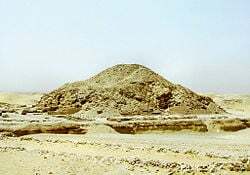 He began his work building upon Mariette's findings in Saqqarah, focusing on tombs and pyramids with complete hieroglyphic inscriptions. This work formed the basis of what are now known as the Pyramid Texts. 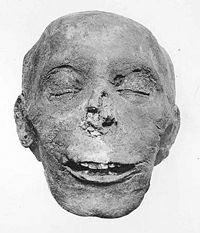 Maspero was also involved in the discovery of a collective royal tomb that contained the mummies of a number of significant pharaohs. Maspero, Gaston. 1875. Histoire des peuples de l'Orient. Paris: Hachette. Maspero, Gaston. 1889. Les momies royales de Deir el-Bahari. Paris: E. Leroux. Maspero, Gaston. 1893. Etudes de mythologie et d'archéologie égyptiennes. Paris: E. Leroux. Maspero, Gaston. 1894. Les inscriptions des pyramides de Saqqarah. Paris: É. Bouillon. Maspero, Gaston. 1897. Histoire ancienne des peuples de l'Orient classique. Paris: Hachette. Maspero, Gaston. 1907. Causeries d'Egypte. Paris: E. Guilmoto. ↑ Miriam Lichtheim, Ancient Egyptian Literature (London: University of California Press, 1975). 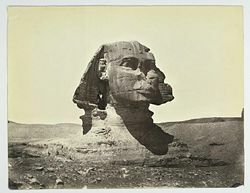 ↑ The Global Education Project, The Sphinx—Some History. Retrieved July 30, 2007. Deuel, Leo. 1961. The Treasures of Time; Firsthand Accounts by Famous Archaeologists of Their Work in the Near East. Cleveland: World Pub. Co.
Jastrow, Morris. 1916. Sir Gaston Maspero. Philadelphia: American Philosophical Society. L'archéologie égyptienne – Full-text Maspero’s work on Project Gutenberg. Maspero’s biography in Dictionaries of Art Historians. Royal Caches at Deir el-Bahri – On Maspero’s work at Deir el-Bahri.